GREAT HARBOUR, Jost Van Dyke, VI – The highly anticipated Foxy’s Old Year’s Night Celebration on Jost Van Dyke is on this year, December 31, 2015, with Bajan band NexCyx to deliver the feature performance. 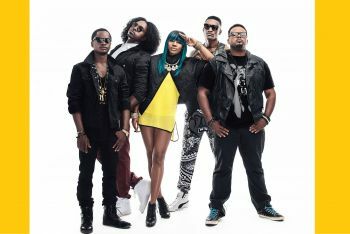 NexCyx is said to be a five-member, award-winning band from Barbados that artfully blends pop, dance, alternative and hip hop together with unmistakable Caribbean influences. The visiting band will take the stage around 11pm and will help ring in the New Year. According to a press release from Foxy’s, General admission to Foxy’s Beach Bar and Foxy’s “Outback” is free and open to the public. The 2015 lineup also features Tortola’s own DJ Dre, The BVI Intrigue Dance Troupe, Mocko Jumbies and a fire dancer. The US Virgin Island’s own MTV/BET comedian, “Buttahman” will serve as the event’s host on the Outback stage. DJ Avalanche will keep the party going into the wee hours. The theme is “Outer Space: Foxy’s Blasts into 2016”. “Futuristic, outlandish, daring or barely-there costumes are encouraged. A small above ground swimming pool and an “outer space foam party” area will be constructed near the stage to help cool down party-goers,” the press release further stated. Foxy’s Famous BBQ will be served in the outback from 6:30p.m. and is first come, first served. Ferries and water taxis from St Thomas, St John and Tortola will service Jost Van Dyke throughout the night. Caribbean Cellars, Road Town Wholesale, Tico Wine & Spirits, New Horizon Ferry and the BVI Tourist Board are sponsors of the event. A woman who identified herself as Susan promised to give further information on the lineup for this year but had not done so as of post time. Whats the cost to get in? Local bands got 5 issues. 1/ they are not versite. 2/ They don't understand the important of practicing so that chemistry that artistry that chorioagrophy. That friendship oneness all these are lacking. 3/ they head get swell quickly..4/ can't be managed no discipline.. 5/ No proper marketing plan..they cant work as a team as one back turn a member stab him in the back instead of having each others back.. Hence they get left behind.... So Sad. BVI must be the only place in the world that don't have a young good band where all the members are under 25 yrs.. We give out more music scholarship per population than the rest of the Caribbean. Nothing to show.. What a shame and disgrace... Then again when bands work for government and can't get pay..That's not a message young musicians want to hear..Not encouraging...let's get together young musicians and make it happen. Like Golden state. Build s good team. Foxy always have the same local entertainment every year! the band ain even up to par. Since when Final Faze is a BVI Favorite?, they sound like a set of noise, heard them in East End Village , 'ill be dammed if I go Foxys for that! Totally agree, Final Faze is AWFUL!! wherever they are playing, I don't want to be. Proven fact that it's who you know and not what you know around here! That's the problem with some ppl...They quick to hate and don't appreciate their own. Do you know how much effort and sacrifice these local musicians have to go through just to entertain. Can you do what they do? Music is a universal language, what may not sound good to you is well appreciated by someone else. Seek ye first the kingdom of God....ill be in church...nextttttt!